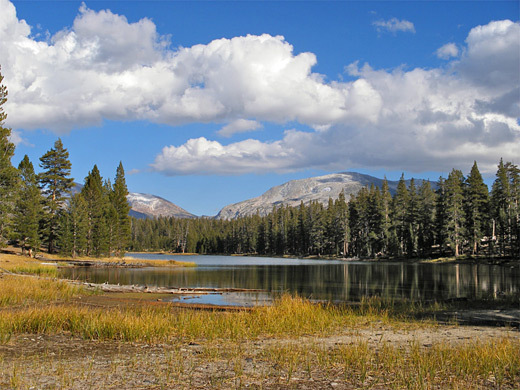 Most trails around Tuolumne Meadows are long and somewhat strenuous, but not the route to Lembert Dome and nearby Dog Lake, two photogenic features both less than a mile from the Tioga Road. The lake is quite small, surrounded by woods rather than granite hills, and while not one of the top sites in this part of Yosemite National Park, it receives quite a few visitors. Lembert Dome overlooks the meadows and the Tuolumne River, requires just a little more effort to reach and is a good choice for a morning/evening hike, to watch the changing sunlight on the surrounding landscape. 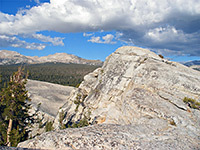 The treeless granite dome has a sheer west face, 300 feet high, that becomes less steep on the other three sides; as well as hiking it is a popular site for rock climbing, offering over 15 recognized technical routes. Dog Lake/Lembert Dome topographic map, Tuolumne Meadows trails. 8 views of Lembert Dome and Dog Lake. 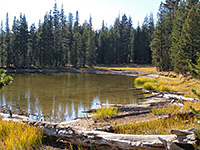 The trail starts a short distance along the paved side road to Soda Springs, at the center of the Tuolumne Meadows region. From a small parking area with an information board and map, the path leads up a wooded slope and through a few treeless areas while climbing quite steeply - 470 feet in total - generally without any views back over the meadows. After about a mile the trail levels out and divides; right is towards Lembert Dome while straight on is to Dog Lake and the more distant Young Lakes. A little further on is another junction, where the main path continues north and a spur branches right, soon reaching the south edge of Dog Lake from where lesser paths follow the shoreline in each direction. Mount Gibbs and Mount Dana rise to the east though the surroundings are mostly thick forest. 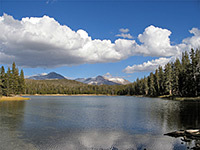 The lake is a good place for a picnic, or for paddling on a hot day. At the first junction, the path signposted for Lembert Dome passes around the north face of the peak then descends steeply back to the highway, joining it 0.9 miles east of the main trailhead; there is no official path to the top of the dome though it is quite easy to reach by leaving the trail at its highest point and walking west then south up a gently-sloping ridge, along a route partially marked by cairns. The dome has several false summits before the actual highest point (9,450 feet), which needs just a little scrambling/climbing to reach. From the crest, some of the nearground is hidden by lower parts of the dome but most of the view is unobscured - a mixture of rolling, wooded hills and some rockier peaks, all centered on the river and its corridor of grassland. An alternative way back to the trailhead is to walk down a steepish ravine on the west side of the dome, through trees and bushes until the path is rejoined quite near the road.